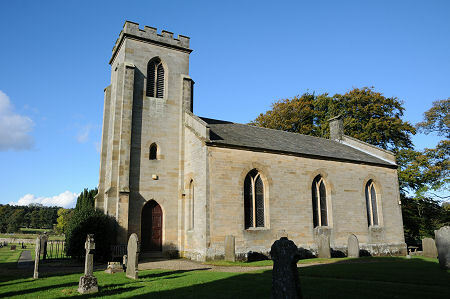 St Michael's Church stands on the west side of the B6320 a little less than half a mile north of the village of Wark-on-Tyne in Northumberland. The church's large car park can be accessed directly from the road, and it is then only a short walk round to the entrance at the west end. At first sight, St Michael's Church looks little different from many others built during the first two decades of the 1800s. It was built in 1818 to a Regency Gothic design by the architect H.H. Seward. The builders were Messrs R. Duke of Gateshead and W. Profit of North Shields, and the total cost was £7,470.17.0 for both the church and the associated parsonage. The reasons for its building are rather unusual. 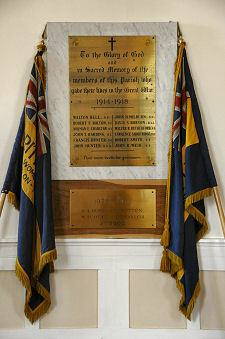 The church was paid for by the Commissioners of Greenwich Hospital, and was one of a number they built in locations needing churches in order to provide livings for chaplains retiring from the Royal Navy. 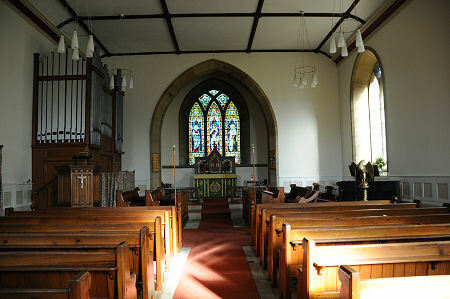 St Michael's Church is the third church known to been built to the north of Wark. According to information displayed in the modern church, the first was built to commemorate the death of King Aldwarf, who was murdered in 688. We've been unable to find out where he was king of, or why he was commemorated in this part of what is now Northumberland. In about 1100 this early church appears to have been replaced by a stone structure. Wark-on-Tyne was traditionally part of the large Simonburn parish, and the church at Wark served parishioners unable or unwilling to make the two and a half mile journey south to Simonburn. After the Reformation the church here went out of use. By 1760 the church was described as being "almost in ruins", though the Bishop who noticed it in passing also commented that it would be a good location for a church to serve the needs of parishioners at the time. It would seem that the church whose ruins were noticed in 1760 might have stood a little further north than its 1818 replacement. The two certainly didn't occupy exactly the same location as ruins of the old church were still being described "near Kirkfield" (a few hundred yards north of the current church) in 1825, seven years after the new church was built. 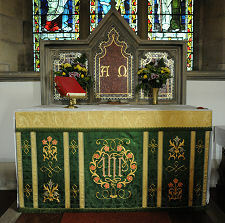 The church was renovated in 1883-4 and again in 1920, but otherwise appears remarkably true to its original 1818 design.